You can put out candle flames without leaving a trail of smoke. Candle extinguishers may seem unnecessary in light of just blowing a candle out before leaving the room. However, they can be charming gifts and put your candle out without that annoying trail of smoke that snakes along for a few minutes when you extinguish the flame using other methods. Whether you buy them for their function or collect them because of the countless whimsical and traditional designs available, candle extinguishers are valuable. Not necessary, mind you, but definitely valuable. They're the solution to the problem of the mid-19th century when it was deemed improper for ladies to blow out candles. Since then, these little extinguishers have become functional decorations for the home. Extinguishers are basically tiny cups (snuffers) on the ends of thin poles. The snuffer is, of course, made of non-combustible material. You simply put the snuffer down over and onto the flame to put it out. The result is minimal smoking. As a side note, candle extinguishers are often referred to as candle snuffers. There is also an automatic candle snuffer on the market today, though it's not meant for decoration. Extinguishers come in so many styles, it'd be impossible to list them all. You can choose from simple, classic styles, whimsical pewter styles to add to your décor, or just the bare minimum, functional styles (like the automatic extinguisher). It may be an overused phrase, but in some cases, candle extinguishers are just candle extinguishers. Nothing fancy, no frills, just something to put out a small flame. Some of them are even automatic. Automatic: Yep, automatic. 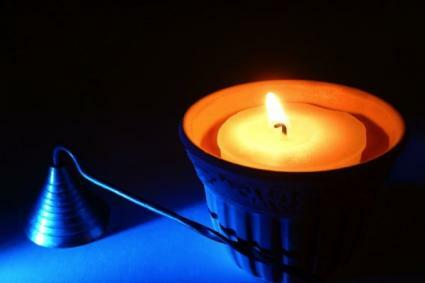 You can attach it to your candle (in a jar), set a timer, and not even have to worry about remembering to blow out the candle before you leave the room or go to bed at night. Wick dippers: These work differently than the traditional candle extinguishers. They're simpler in design and are used simply to hook around the wick, dip the wick into the warm, melted wax, and center the wick again. Again, very little smoking is involved with this method. You may feel that simply giving a candle as a gift isn't enough, but you're at a loss as to what else to include. Why not make up a gift basket or bag that includes a candle extinguisher that fits the mood of the candle? For example, you're giving a pine-scented candle that you know will conjure up fond winter holiday memories of skiing in Colorado. You could add a few decorative pine cones and a silver extinguisher with a cabin on the end. Candle extinguishers are perfect for tying together a theme. Silver Gallery has an enormous selection of candle extinguishers. Choose from the unique Pewter Capital Candle Snuffer, the Lighthouse Candle Snuffer, the elegant Floral Candle Snuffer, the Classic Pewter Candle Snuffer, and more. Be prepared to spend between $17.00 and $65.00. While most are on the low end of the price range, they do offer designer candle snuffers, like the Oscar de la Renta Santo Domingo Seashell Candle Snuffer. Candle Watch has the first automatic candle extinguisher on the market. The Rosemary Company has a fun idea, though it may result in a ruined birthday cake. It's a Birthday Candle Fire Extinguisher. It looks like a real fire extinguisher, but you fill it up with water, point it at the flames, and shoot.